1812: born in Edo. He is the son of Takashimaya Eizô, a fireworks-seller at the Ichimuraza. 1820: he becomes a disciple of the actor Ichikawa Danjûrô VII. 4th lunar month of 1821: he makes his first appearance on stage, at the Nakamuraza, where he receives the name of Ichikawa Eizô I. 1822: Ichikawa Eizô I takes the name of Ichikawa Yonezô III. 8th lunar month of 1829: Ichikawa Yonezô III takes the name of Ichikawa Yonejûrô I. Spring 1844: Ichikawa Yonejûrô I takes the name of Ichikawa Kodanji IV at the Kado no Shibai, playing in the drama "Keisei Ishikawa-zome". 2nd lunar month of 1847: Kodanji plays at the Kado no Shibai the role of Tadanobu in the drama "Yoshitsune Senbon Zakura". 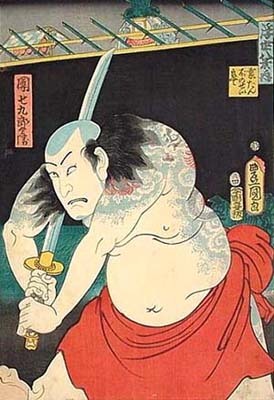 His stage partners are Ichikawa Ebizô V (Yoshitsune), Arashi Kichisaburô III (Yokawa no Zenji Kakuhan) and Arashi Rikaku II (Shizuka Gozen). He performs the same role in the same play in Kyôto at the Kitagawa no Shibai in the 5th lunar month. Fall 1847: Kodanji goes back to Edo. 11th lunar month of 1847: Kodanji plays at the Ichimuraza in the drama "Genke Hachidai Megumi no Tsuwamono"; he also plays all the roles of a 7-role hengemono entitled "Shiki Utsushi Tosae no Futsutsuka" [more details]. 9th lunar month of 1850: premiere at the Nakamuraza of the drama "Minoriyoshi Kogane no Kikuzuki"; Kodanji plays the role of the koshimoto Okiku [more details]. 4th lunar month of 1851: premiere at the Nakamuraza of the Tokiwazu-based dance "Kioi Jishi Kabuki no Hanakago", commonly called "Kioi Jishi", starring Bandô Takesaburô I, Onoe Kikujirô II, Iwai Kumesaburô III and Kodanji. 8th lunar month of 1851: premiere at the Nakamuraza of Segawa Jokô III's drama "Higashiyama Sakura Sôshi" (commonly called "Sakura Giminden"); Kodanji plays the roles of Asakura Tôgo, Sumahei and Shinonome [casting]. 3rd lunar month of 1854: premiere at the Kawarasakiza of Kawatake Shinshichi II's drama "Miyakodori Nagare no Shiranami"; Kodanji plays the roles of Shinobu no Sôta (in reality Yamada Rokurô, a retainer of the Yoshida clan) and Minezô [casting]. 7th lunar month of 1856: Kodanji plays at the Ichimuraza the three major male roles of the classic "Yoshitsune Senbon Zakura", namely Tadanobu, Tomomori and Gonta. 9th lunar month of 1856: premiere at the Ichimuraza of Kawatake Shinshichi II's 9-act drama "Tsuta Momiji Utsunoya Tôge". The 2 leading stars are Kodanji (the blind masseur Bun'ya and the thief Niza) and Bandô Kamezô I (Itamiya Jûbê). 11th lunar month of 1856: premiere at the Ichimuraza of Kawatake Shinshichi II's drama "Shôchikubai Yuki no Akebono"; Kodanji plays the role of Yaoya Oshichi [casting]. Premiere at the Ichimuraza of the dance "Joro no Makoto Osada no Chûkô"; Kodanji plays the role of the tengû [casting]. 1st lunar month of 1857: premiere at the Ichimuraza of Kawatake Shinshichi II's drama "Nezumi Komon Haru no Shingata" (commonly called "Nezumi Kozô"); Kodanji plays the roles of the tôzoku Inaba Kôzô (in reality Yosobê's son Yokichi), Izumi no Koshirô Chikahira, Takashima Beizan (in reality Inaba Kôzô) and the bokusha Sazen (in reality Inaba Kôzô) [casting]. 7th lunar month of 1857: premiere at the Ichimuraza of Kawatake Shinshichi II's drama "Ami Moyô Tôro no Kikukiri" (commonly called "Kozaru Shichinosuke"); Kodanji plays the roles of Kozaru Shichinosuke and Nakamanjiya Yahê [casting]. 3rd lunar month of 1858: premiere at the Ichimuraza of Kawatake Shinshichi II's drama "Edo Zakura Kiyomizu Seigen"; the nibanme of this drama is now entitled "Kurotegumi Kuruwa no Tatehiki" in the Kabuki repertoire (commonly called "Kurotegumi Sukeroku"); Kodanji plays the roles of Seigen and Sukeroku [more details]. 2nd lunar month of 1859: premiere at the Ichimuraza of Kawatake Shinshichi II's drama "Kosode Soga Azami no Ironui" (commonly called "Izayoi Seishin"); Kodanji plays the role of the priest Seishin, who becomes the thief Seikichi, [casting]. 9th lunar month of 1859: premiere at the Ichimuraza of Kawatake Shinshichi II's Kiyomoto-based dance "Jitsugetsusei Chûya no Oriwake", commonly called "Ryûsei". The leading roles are played by Kawarasaki Gonjûrô I, Iwai Kumesaburô III and Kodanji. 1st lunar month of 1860: premiere at the Ichimuraza of Kawatake Shinshichi II's drama "Sannin Kichisa Kuruwa no Hatsugai"; Kodanji plays the roles of Oshô Kichisa and Kiya Bunri [casting]. 3rd lunar month of 1860: premiere at the Ichimuraza of Kawatake Shinshichi II's drama "Kagamiyama Gonichi no Iwafuji"; Kodanji plays the roles of the ghost of Iwafuji and Torii Matasuke [casting]. 7th lunar month of 1860: premiere at the Ichimuraza of Kawatake Shinshichi II's drama "Hachiman Matsuri Yomiya no Nigiwai" (commonly called "Chijimiya Shinsuke"); Kodanji plays the role of Shinsuke [casting]. 8th lunar month of 1861: premiere at the Moritaza of Kawatake Shinshichi II's drama "Sakura Sôshi Gonichi no Bundan", a revised version of Segawa Jokô III's drama "Higashiyama Sakura Sôshi"; Kodanji plays the roles of Asakura Tôgo, Katagiri Saizô and Kôzen [casting]. 10th lunar month of 1861: premiere at the Moritaza of Segawa Jokô III's drama "Zôho Futatsu Domoe"; Kodanji plays the roles of the farmer Yonesaku and Ishikawa Goemon [casting]. 8th lunar month of 1862: premiere at the Moritaza of Kawatake Shinshichi II's drama "Kanzen Chôaku Nozoki Garakuri"; Kodanji plays the roles of Murai Chôan and the Iseya bantô Kyûhachi [casting]. Revival at the Moritaza of the drama "Miyajima no Danmari", with a new script written by Kawatake Shinshichi II and starring Kodanji in the leading roles of the courtesan Ukifune and the thief Kesatarô. 2nd lunar month of 1864: premiere at the Ichimuraza of Kawatake Shinshichi II's drama "Soga Moyô Tateshi no Goshozome"; Kodanji plays the roles of Gosho no Gorozô and Yuri-no-Kata [casting]. 11th lunar month of 1864: premiere at the Ichimuraza of Kawatake Shinshichi II's drama "Koharunagi Okitsu Shiranami" (commonly called "Kogitsune Reiza"); Kodanji plays the role of Nippon Daemon [casting]. 2nd lunar month of 1866: Kodanji appears on stage for the last time, at the Moritaza, playing the roles of Oniô Shinzaemon, Kudô Saemon Suketsune, the ghost of Kawazu Saburô Sukeyasu, Chichibu no Shôji Shigetada and Ikake Matsu in the new year drama "Fuji to Mimasu Suehiro Soga". 8th day of the 5th lunar month of 1866: Kodanji dies in Edo. Ichikawa Kodanji IV was a short-sized actor, who had none of the physical features, which are essential for Kabuki stars (great voice, fine eyes, beautiful face) but became one of the best tachiyaku of the nineteenth century. He excelled in hayagawari and was a pionner for many keren like spectacular chûnori. It is his association with the leading playwright Kawataki Mokuami, which makes him of interest in the history of pre-Meiji Kabuki. The two formed a very close partnership and Mokuami wrote some of his best sewamono for Ichikawa Kodanji IV.